After putting several rounds through your firearm, build up from lead, copper and other material begins to form. This build-up can lead to accuracy and function problems down the road. 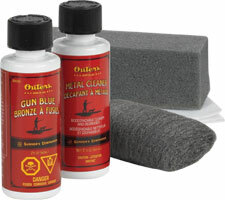 Our full line of gun cleaners and degreasers effectively cleanse all metal gun parts, bores and precision mechanisms. Get an extremely easy, complete clean without a lot of vigorous brushing. All you need to do is simply spray, wait and wipe away. Foaming Bore Cleaner dissolves copper and powder residue quickly and effectively with no harsh chemicals. This non-toxic solvent allows you to efficiently clean your firearm without worrying about strong odors and harmful solvents. Removes powder, lead and copper for a complete clean. This powerful bore cleaner is for use in firearm barrels and on metal parts and mechanisms. Removes lead deposits, powder residue and copper fouling. Non-acid formula leaves behind a light layer of oil for corrosion protection. This effective cleaner quickly blasts away of grease, dirt and oil build-ups, while softening powder and plastic wad residue. It dries quickly without residue, leaving metal clean and free of debris. This product is also effective at removing plastic fouling from choke tubes. This canton-flannel polishing cloth is impregnated with lubricant, corrosion inhibitor and silicone ingredients. Excellent for removing smudges, streaks and oily fingerprints. This cold blue chemical penetrates deep to leave a handsome, long-lasting, blue-black finish. This rust remover eliminates and protects against rust and corrosion without removing gun bluing.